Hard to believe it is mid May when the weather is still cold and miserable; yet asparagus and strawberries are out and the days are longer.... Soups to keep you warm are so last winter! I want to see fresh ingredients in my plate and I long for simply prepared food. 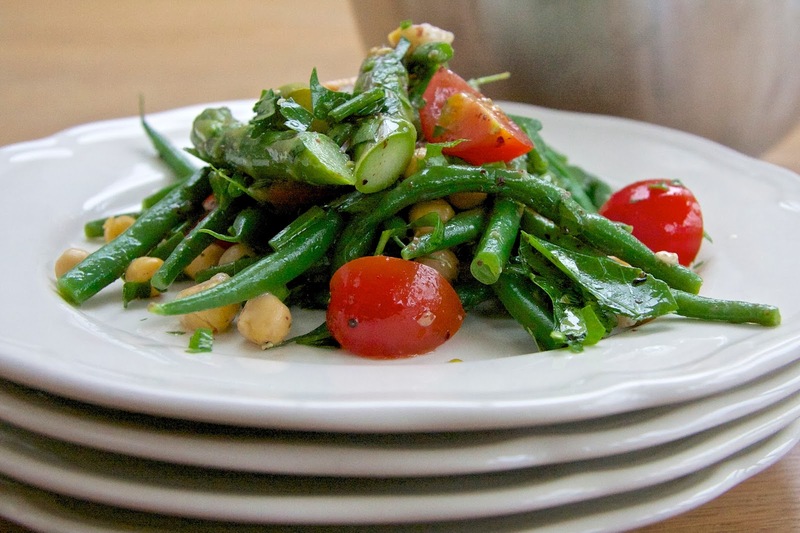 Inspired by Lebanese fattoush I have put together warm salad using asparagus and chickpeas. Dressed with lemon and sumac it is undeniably Eastern. I have replaced bread morsels with cooked chickpeas which are not only wholesome but also gluten free and instead of onions I used a bunch a finely chives, which gives it a herby subtle taste. Cook the beans in a steamer until just tender. Stop the cooking by running quickly under cold water. Set aside. Steam the asparagus spears for 3 to 4 minutes. Cut the baby tomatoes into quarters and transfer to a large bowl. Strain the hot chickpeas and return to the pan. Dress with lemon juice, sumac, vinegar and olive oil. Place all the vegetables together with the tomatoes in the bowl. Top with the warm chickpeas and mix to combine. Add the chopped herbs and serve.